Looking for a new way to build cost effectively? These machines are used to build affordable, sustainable, and long lasting SIP Panels for: Affordable Housing, Emergency Relief Shelters, Disaster Relief Shelters, Schools, Clinics, Commercial Buildings and more. Traditional building processes are complex, take lots of skilled labor, involves dozens of products, and are expensive to ship … right? Not anymore! IADDIC is the only supplier of SIP Panel manufacturing equipment used to build the complete building envelope for almost typr of construction, almost anywhere in the world; on the job site, where you reap the benefits of building affordable structures using the best construction products available. 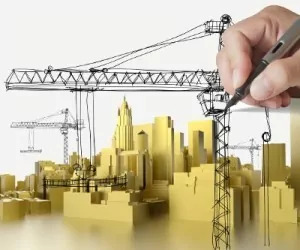 IADDIC removes the complexity of construction and dramatically speeds up the building process by reducing the cost of international construction. 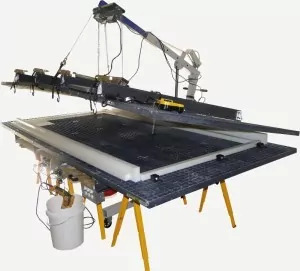 A true SIP Panel system featuring on site sip equipment like the field operated SIP Panel Press for the fabrication of SIP Panels used to construct many building types including; SIP Panel housing and thin wall structural insulated panels sips for emergency shelters. A lower cost alternative to shipping prefabricated panels, IADDIC sip equipment offers years of durable trouble free service. Automation packages are available to improve production output and quality. The Global Mobile Shelter Factory connects automation to the SBS4000 for high volume building of many structures. The system is equipped with the dispensing systems and controls needed to maintain continuous production over longer periods of time. Complete SIP Panel factory in a shipping container that incorporates traditional the traditional manufacturing process featuring everything you need to construct high-quality SIP Panels for the most demanding projects. Almost anything can be built using SIP Panels and the GMF Panel Factory makes building panels possible anywhere in the world. Multiple “specific use” factories are available for the construction of schools, clinics or specific use buildings. However the concept behind all of the Global Mobile Factories is the same: to provide everything needed to produce the most economical building envelope possible. 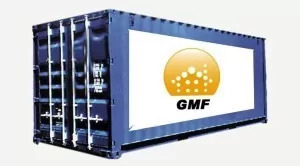 The GMF’s address everything needed to construct the complete building envelope including wall systems, insulated roofing systems, framing, and trim.